On the day after Christmas, old Joseph sauntered down the stairs as quick as his creaky knees would carry him. His heart was full of wonderment, his laughter-lined face alight with a glow he hadn’t felt since he was a child. Maybe today would be different, he thought. Something had to be different. It wasn’t until he rounded the corner to see the twinkling Christmas tree that his heart began to sink. The scene was the same as he left it Christmas Day. The white and green bulbs were ablaze, miniature twinkles dancing across the ornaments; tin soldiers and tiny dancers, glass balls, and nutcrackers. The presents, wrapped up in silk ribbons and sashes, were just as he left them. The paper was still snug to its seams, delicately creased and pulled tight like his late wife had taught him. Everything on Christmas Day had to be perfect, she had said. It’s too important to neglect. We don’t get many. We best not squander them. His wife had managed 68, but her last Christmas was expected. Cancer had taken some of the best of them and spared her the worst of them. The worst of them was yesterday. How many Christmas Days do we get? “Six,” he said, frightening himself with the conviction in which he said it. His granddaughter had six. Yesterday would have made seven, but she never saw more than the anticipation of it. She had opened 14 windows on the advent calendar and he had punched the rest on his own. His tired hands always shook as they did it. His eyes traced the silhouette of the tree, pausing briefly on the rocking horse before finding its center. She was there, slightly higher, an angel ballerina in the fourth position. His granddaughter had told him it was called a quatrième, one arm in and one over the head, her wings catching hints of green like a veil of illuminated effervescence. “Open it? Why, it isn’t even Christmas yet,” he feigned his protest. “Oh, it’s for Christmas? Then maybe we better save it,” he teased. The attention to detail was uncanny. The reflective blue and silver wrapping with its fleur de lis pattern was pulled tight, edges creased by her tiny hands. The silk ribbon was carefully entwined at the bottom so it could be pulled over the sides and tied on top. And then, as a finishing touch, a silver bow hid away where the two ends had been tied together. He had opened a hundred presents just like this one. His wife’s meticulous touch was written all over it even if Emily had done this one herself. His daughter never had the same patience, but this precious skill seemed to have skipped a generation and survived. It made him miss his wife all the more. His big frame swayed at the thought of her, springing up like a wave. The dizziness was so unexpected he barely caught himself. Emily was so much like her grandmother. Joseph found himself retracing the footsteps he had taken just a few days before, from the living room to the kitchen with his hands clutching the memory of the package. He pulled out one of the vinyl-backed chairs, but didn’t sit down. “A spot of coffee might do me good,” he had said to her. He said the same thing again, but there was no one to hear him this time. “One, two, three, four, and five,” they had counted out the leveled scoops together as he dropped them into the brown cone filter. As soon as he shut the top of the machine, she would push the button in a giggle of delight. She would always push it quick, she reminded him, in case he would have a flash of absentmindedness and follow through with his morning routine as if she wasn’t standing there. Once she even made him turn it off it again, right after he had accidentally gone through the motions. But it didn’t matter this time. There was no one waiting to push any button. There never would be again. As he took hold of the bow, Emily squealed. He stopped long enough to smile at her before resuming his practiced look of concentration, a medical doctor performing a gentle surgery on the world’s smallest patient. Clutching each of the loose ribbons, he pulled. They fell away in a cascade, leaving only the fleur de lis wrapping behind. He ran his fingers over the seams looking for tape that held it together and pulled it away. The gift paper inside chaffed against the sides as he pulled it up. And there she was — an angel ballerina with her soft white dress fanning outward and her wings outstretched behind. She was perfectly cast, porcelain dressed in fine lace. He was immediately dazzled by every inch of it. Her legs were crossed, one in front of the other. Her arms caught in a motion, one tucked inside and the other reaching out to her right. “A troisième,” he recalled, taking in too much coffee with a choke. Is that what she had said? Troisième? Or did she say it was a quatrième? It was hard to remember. Coffee in hand, he moved back toward the living room. He might not be able to remember, but the angel would. They had placed it slightly above center on the tree together, a position of prominence so it could greet him at eye level every morning and he would think of her. “Troisième or quatrième?” he asked the emptiness. The angel’s hands were held high this time, both over her head, bent to make a graceful soft oval. Cinquième. The final position. He winced at the memory. He was wrong. One, two, three, four, five. It was a troisième when they placed it, but a quatrième by Christmas. He squinted at the impossibility of it. He had never seen a cinquième before. He peered in for a closer look. But before he could take the angel in and find any previously unnoticed moving parts, his inspection was interrupted by a knock. His eyes strayed to the windows that framed the front door. “Expecting someone?” said a whisper as clear as the last day he saw her. “No, she’s not coming,” he said in time with the second knock. “Open it. Open it,” said the angel. He took a step toward the door, toward the faintest of outlines as he saw it through the glass and curtains that framed it. The sight of it made his heart quicken and each subsequent step faster. There was a girl at his door. He was running by the time he reached it and pulled it open. He looked at her for a full minute, an awkwardness growing between them before she broke the silence and the spell. The neighbor’s girl stood before him and all the cold raced in on either side of her. “How nice of her,” he said, pulling at his robe and momentarily embarrassed at the mess. “Yes, bring them on in and you along with them,” he said. “I’ll put them in the kitchen for you,” she said, walking in slowly, hugging the doorframe with her back to get by him. The reference made her pause, stop halfway to the kitchen and set the cookies down on an end table. As she turned back toward him to say something, the tree caught her eye. He looked at the tree, seeing a ghost of himself lift Emily so she could place the angel. It had only taken a beat before Emily had cut to the punch line. The angel was the opening to his heart. “There, perfect. Now, about my Christmas list,” Emily had said, pulling a tattered list from her pocket while still in midair. He had spun her around as soon as she said it and hugged her, almost falling over in the process. Yes indeed, Christmas Day is too important to neglect. How many Christmas days do we get? One, two, three, four, five ... six. He had filled her list, every last wish. He did it early too, not wanting to waste a minute on procrastination but rather give it all up to anticipation. He could have never guessed he did it too early. “They’re not mine,” he said. “Oh,” Mary said, her face sullen. But instead of leaving on the command, she ran up and hugged him, burying her head in his robe. It was soft, warm, and for the first time in her life she understood why Emily had gone on and on about it. There was something about Joseph that made you feel safe like a cub nestled to some ancient bear. The two of them sat together for the next hour, Joseph watching as the girl unwrapped the gifts as carefully as he had wrapped them. If the magic of wrapping and unwrapping skips generations than maybe it can skip households too, he thought as he watched her. As she continued, he shared something about each gift and why Emily had asked for it. Every one of them had a story. One, two, three, four, five of them. There weren’t many, but his granddaughter was never one for long lists. It was always about the giving and gratefulness, much like her grandmother. He held the angel out to her, its delicate features captivating them both in the passing. Even off the tree, the jewels on her dress shimmered and her wings captured the light. She was smiling, something Joseph had never noticed before. Her arms were bent in a soft circle below her shoulders. Premiere. The first position. “Merry Christmas, Joseph,” she said, taking the angel from him and giving him a small but comically dramatic bow before turning away. As she walked down the path, Joseph gave her a final unseen wave, hand up, and shut the door. He slowly walked over to the tree, meaning to bend down and pick up the carefully folded but discarded paper. But then he thought better of it. He sat down instead and took in the scene. It was another important Christmas, one day late but no less significant. It might have even been the most important Christmas of all. He scanned every inch one last time, from the wrapping paper to the tree before settling on the space where he had taken the angel from the tree. It was still there, animated and moving through the positions. One, two, three, four, five. Premiere, second, troisième, quatrième, cinquième. The final position. “Emily,” he smiled and closed his eyes as she reached out for him. She had come home, after all. And now, Joseph could go home too. When Mary and her mother returned a few hours later, there was no one left to welcome them. 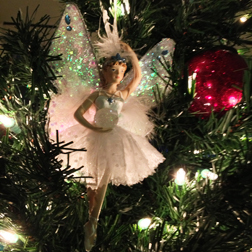 This first draft short story was inspired by my daughter and her favorite Christmas ornament. There wasn't any other reason to write it, other than to put something down that reminds us all how lucky we are, no matter what. Happy holidays. May every Christmas be your most important. All of them. Until after Jan. 1 then. God bless. For every advantage big established companies have in the field today, they have some disadvantages too. Part of the problem is newness or, more precisely, the lack of newness. They just do what they do. Even if they do what they do well, they have a disadvantage on the newness scorecard and it's not only cosmetic (as in a new advertising campaign). It has to do with what they are doing or aspiring to do that conveys a sense of urgency and excitement. But more importantly, there is a psychology to it all. A steady stream of newness helps make everything worthwhile. The biggest cliche in business circles (and sometimes individual lives) is that everything is going well or good, real good. Few people ever offers and specifics. They treat the entire conversation as a string of obligatory niceties. "Oh, you know. Moving along." If zombies could talk, this would be their conversation. It's frightening and pathetic all at once while explaining why zombies have resurfaced as leading paranormal lore. We're terrified they might be us. The problem with many businesses, even startups after a surprisingly short time, is they all gravitate toward the same. They experience a tremendous surge of elation before falling into routine or boredom. Complacency is the same thing with just another name. Newness tends to be inspired. The three paths to prevent zombification. There might be more, but three is enough to illustrate the point. The businesses that are most susceptible to boring either tell it all, have nothing to tell, or are too busy shrinking themselves into nothingness. The objective is to do the opposite without killing yourself. • Initiate one new thing every month. While this is scalable to company size, the point is to make it manageable. Having even one new thing (with a definite beginning and end) can ensure your company is always moving forward. It's all right if it overlaps other months. It's the start that counts, especially if you can break up one project into several milestones. • Bring more to life than you kill. Whether or not there is an economic recovery in progress, many businesses have become too used to the idea of cutting back. Even when cutbacks or putting things on hold becomes a primary objective, companies and organizations cannot afford to kill more than they create — even if that means creating while cutting back. Newness can come in efficiencies too. To recap, companies and organizations can plan initiatives to phase over the course of a year (phased in to prevent overload and burnout), show restraint in communicating anything until it is relevant (even if some of the work is already done), and always plan to create more newness than they kill. The latter is important, especially in light of how many organizations I have seen kill off programs without replacements. Doing so almost always creates the impression of surrender while demoralizing employees and board members at the same time. Worse, even if the organization attempts to salvage a program later, resurrection (especially at 50 percent) will only reinforce that they let something go. The same holds true for individuals. Musicians are always working on the next track. Artists are always working on the next work. And authors are at least thinking about the next book. It's how they keep their audiences engaged — something new is always on the horizon. In fact, it doesn't even have to be as lofty as all that. Newness can be big or little, long or short term. The "what" doesn't matter as much as the continual "when." 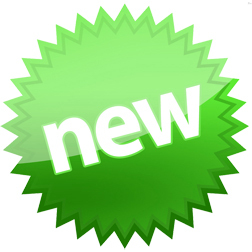 People like 'newness' news, especially the good kind. Almost anything might work (or ask your kids for some vicarious newness), just as long as you don't have to bore people by saying fine, good or the same old thing. Do that too often and they might not even bother to ask. If you ever wanted to test against the fragility of a social network, Instagram is the photo sharing social network to watch. Facebook, which is well known for overreaching on some terms and privacy issues, has decided to claim ownership rights on everything members upload and share across Instagram. Instagram, which was one of the few apps worthy of review in 2011 (pre-Facebook) on our alternative review site, received a respectful opening score before any of the other bells and whistles it has added since. We gave it 5.2 on our alternative scale, which would be right around 7 or 8 on a non-alternative 1-10 scale. It rated high because it revamps the artistic fun associated with Polaroid cameras for the modern age, using digital data instead of the integral film commonly associated with Polaroid photos. So what changed? Instagram via Facebook is now asking for unspecified future commercial use of people's photos, which means (as the article states) a hotel in Hawaii can use your Instagram photos if they pay Facebook. The member won't receive any money. They won't receive any credit. They won't even receive notice. What will the Instagram member get? A whole lot of headaches, advertisers too. One has to wonder about the logic of such service changes, especially because it opens up a steady stream of problems even if members don't care. The worst of them, even for Facebook, is that this change of policy makes them a publisher and not a sharing service, culpable for the images people post. But there are other problems too. The very idea that one day an Instagram member might see their photo in a commercial advertisement without compensation or notification is flawed. Given that most photographers would claim copyright infringement before realizing they signed away their rights on Instagram, I would advise any my clients to avoid purchasing pics via such a pariah policy. In fact, Instagram makes it all especially risky because there are thousands of bands, authors, and artists that have turned to Instagram as their preferred photo sharing tool. Given their struggles with preserving copyrights in the digital age, it doesn't seem plausible they can afford to support a service that claims ownership of concert shots and album designs or artist proofs and dust covers. I just don't see it. Amateurs will have plenty to worry about too. Their kids could become the poster children for anybody and everybody Facebook decides to the sell content to. In some cases, it puts kids even more at risk. In other cases, it will be even more creepy in the hands of some questionable advertisers buying the rights. A speculative analysis of why Facebook made this logic leap. While Facebook/Instagram hadn't made a public statement about the policy changes, one could assume that the logic leap was made because Facebook makes similar claims on content shared to Facebook. Along with this precedent, people have largely ignored the problems with the Pinterest policy too. What these two policies have taught social networks is that once people become attached to a service, they tend not to care and outright ignore any policy changes. They give up their privacy. They give up their rights. They give up everything (as long as they can use the service). They just don't care. Except in this case, Facebook seems to have made a fatal flaw in assuming people would treat Instagram policy changes the same. First and foremost, unlike Facebook, there isn't a compelling reason to use Instagram given all of the other photo sharing networks in existence that don't claim ownership. 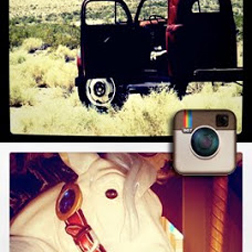 While Instagram is preferred, there are plenty of alternatives. Even the effects features have since been duplicated across a wide variety of apps. All anyone has to do is use them to achieve the same result. This makes or an interesting case study in that unlike Facebook, which has achieved a must-have status in perception if not reality, Instagram still feels optional despite the $1 billion price that Facebook paid. It also makes an interesting case study because Facebook is being forced to continually prove its own stock price while illustrating why its publicly traded price continues to struggle. It might be worth something as the leading social network today, but it is still being managed in a rather immature fashion. Sooner or later, the front runner might implode like almost every other front running social network before it. A final thought on rights and social networks in general. Personally, I've always found myself operating in two different directions when it comes to ownership and the Internet. On one hand, publishers and distributors have to be open minded about Fair Use laws. Even when it comes to my content, here and sometimes other places, I've taken a lenient stance provided links and credit are given when links and credit are due. Social is all about sharing, much like TripAdvisor has realized in opening up its content to thousands of other sites. On the other hand, I have practiced restraint and resistance to every social network I have ever worked with that has tried to claim ownership of other people's content. In one instance, I turned down an offer to help edit a book made up of member-generated content after learning that the content originators would be credited but not notified or compensated. I made my case strong enough that the network dropped the idea. The bottom line is that there isn't any need (except greed) for social network startups or established behemoths to claim anything but enough rights to enable people to share their content. Anything beyond a post or picture as a one-time share is an overreach that people ought not to ignore. They ought not to ignore it for two reasons. Social network members that ignore policy changes risk becoming little more than slaves to the social networks they support. And social network providers, even if they are more sensible in their own policies, need to police their industry against such abuse or all of them will risk future legislation and laws that reverse and regulate the immaturity of a few. Immature really is the right word. Despite the best guesses of some, Facebook is ruining Instagram. I will hate to leave, but if Instagram doesn't self correct by Jan. 16, I'll be among the departed. Update: In traditional Facebook fashion, Instagram responds to the pushback with an apology. Online sales are expected to increase this year. Online shoppers are also increasing their already high expectations. 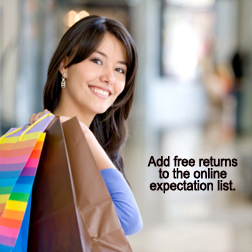 Now that almost half of all online retailers are offering free shipping, more consumers are expecting free returns too. In fact, one recent survey conducted by Harris Interactive for Shoprunner, which is a shopping services network, shows as many as 81 percent of online shoppers say they are not likely to make additional purchases from websites that charge for returns. Sixty-nine percent also say that the process for returning online purchases is too complicated. There are hundreds of decisions companies make that impact brand. While most marketers invest significant time in attempting to increase sales, far too few are concerned about customer life cycle — the potential for one client to make multiple purchases for months, years, or even an entire lifetime. Some invest everything into incentivizing purchases without ever considering the other touch points related to the transaction. The reality is that everything counts. Customers are looking for ease of purchase, speed of shipping, cost of shipping, shipment packaging, product performance, return policies, and cost of returns. The impact any of these touch points and others have can make all the difference. How much? According to the study, customers paying for their own returns decrease spending with retailers between 75 and 100 percent within two years. In contrast, customers who receive free return shipping will increase their spending with the retailer by 158 to 457 percent in the same period. There are several other areas where many online retailers can step up their game. • 67 percent of online shoppers would purchase more online from mobile devices or computers if they are already already familiar with the same secure, easy check-out procedure. • 77 percent said they would spend more online if retailers offered free 1-2 day shipping (but also admit that faster shipping options gives them more reason to procrastinate). • 80 percent of consumers say they like the option of picking up online purchases in person, a concept recently included in a New York Times article covering how online and in-store shopping have changed. But improving policies and technologies isn't the only area where retailers can step up. Customers are keen on seeing technology improve in-store purchases too. Mobile isn't only the answer for consumers. It is quickly becoming the answer for retailers too — everything from offering free Wi-Fi to finding out more product information to giving customers immediate access to inventory that is not readily available in the store can increase sales and improve customers retention in person or online. Bloggers have known it for some time, but it works for big business too. The goal of effective branding doesn't always begin and end with attracting visitors to an organizational site but creating content other people want. For some time, TripAdvisor has been putting this idea into practice. The number of people who view TripAdvisor content on sites other than TripAdvisor has doubled since last year. Now, more than 300 million visitors per month see TripAdvisor content on sites like Best Western International and Thomas Cook instead. They aren't the only ones. 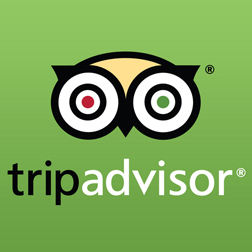 More than 500 companies carry TripAdvisor content. Site visits shouldn't trump sales. The program, which originally started as means for businesses (and TripAdvisor) to encourage more traveler reviews, has since grown into an array of services for travel brands to syndicate TripAdvisor content, integrate site technologies, engage customers, and increase bookings. "We recognize that a growing number of guests turn to social communities and online reviews for research before they book a hotel stay," said Dorothy Dowling, senior vice president of sales and marketing for Best Western. "Now our guests read TripAdvisor traveler reviews without leaving our site, which not only saves time but also helps each guest choose the right Best Western hotel for their needs." There is another reason for companies to consider the option, according to TripAdvisor. According to the September 2012 PhoCusWright survey, 53 percent of travelers won't book a hotel if it doesn't have TripAdvisor reviews, which includes 75 million reviews and opinions. The volume of user-generated content attracts about 60 million unique visitors (75 million if all 19 media brands owned by the company are included). In other words, TripAdvisor content offsite is read by five times as many people as it is onsite. And interestingly enough, TripAdvisor doesn't care. As many as 60,000 unique domains carry TripAdvisor content, shifting the company away from attracting site visitors and reaching out to them instead. The concept brings new meaning to the old concept that winning companies look for innovations, ideas, and spaces where their competition isn't. In this case, it turns out that the places where TripAdvisor competition isn't is everywhere they could have been — on the places they review. A new study sponsored by EMC Corporation found that despite the unprecedented expansion of the digital universe due to the massive amounts of data being generated daily by people and machines (an average of 5,247 GB of data for every person on earth by 2020), only about 0.5 percent of the world's data is being analyzed. The two-fold challenge for marketers in the next decade. If marketing firms and IT departments capture, organize, and analyze too little data, they are more likely to capture big shadows with distorted information. 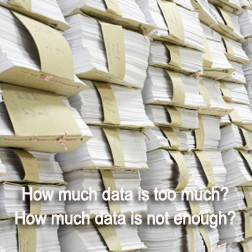 If marketing firms and IT departments capture too much data, most of them will succumb to information overload paralysis. This is doubly true because the amount of information stored in the digital universe about individual users exceeds the amount of data that they themselves create. Every day, algorithms are generating data about everyone who is active on the Internet that is only as good as the proposed algorithm. The effectiveness of these algorithms can be appreciated simply reviewing the advertising content being served up on various social networks and ad revenue websites. If the advertising doesn't match your needs or interests, it is very likely caused by an ineffective algorithm that is attached to your data (and then attracts more erroneous data). The potential for advertising dollar waste is tremendous. Author Geoff Livingston scratched the surface in his recent article Does a Social Score Make a CMO? Forbes attempted to determine the top 20 Fortune CMOs baed on social scoring as opposed to outcome measurements tied to their work. Social scoring is largely useless data, casting shadows that may or may not be true especially because people who work for big brands tend to attract more followers regardless of their contributions or real influence (even within the field). Ergo, in some cases, it is the brand and not the person attracting attention. Likewise, other people work hard to game the system, either trolling for follow-back propositions or purchasing followers to inflate perception. Big data doesn't know the difference, despite claims to the contrary. These are only small examples of the bigger problem. The point is that as data seemingly becomes increasing accessible that doesn't mean that its value increases with the volume. Even if Western Europe is currently investing $2.49 (USD) per GB, the U.S. $1.77 per GB, China $1.31 per GB, and India $.87 per GB to manage the digital universe, there are no guarantees that big data can capture more than distorted reflections of the people marketing wants to persuade. Big data can be useful, but only when it is continually vetted by traditional research. Even as data measurements improve for anyone hoping to track, research, and predict consumer sentiment, marketers ought not become lazy researchers relying on slivers of data or online surveys. If social networks are an opportunity for organizations to be more human, then big data collection ought to work toward understanding behavior as opposed to dehumanizing population groups. Some marketers today might be surprised to find that their best efforts to automate and insert keywords (as an example) might produce a measured response in the short term but fail in vetting sessions that involve live customer interviews, face-to-face interactions, or even focus groups. While the challenges are not insurmountable and provide additional opportunities beyond the digital universe, it goes a long way in demonstrating the need to think beyond the obvious, especially when what is "obvious" only accounts for a fraction of a percent, less than traditional methods used to capture. While the study raised many of the questions above, there is additional information that can be gleaned from it for marketers and IT professionals. For more highlights from the study, visit the EMC multimedia overview page. It presents eye-opening information about how much we don't know vs. what we think we know as well as an even analysis of challenges and opportunities for big data. There is plenty of speculation as to why Rupert Murdoch's The Daily folded, but don't fooled by some of it. Any contention that the tablet is to blame is a mistake. The medium wasn't the problem. It was the message. It was the business model. 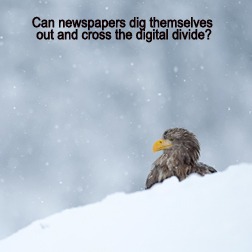 It was misunderstanding what consumers want from digital news. For every failed newspaper-turned-news tablet, there are dozens of successes. And none of these successes are crippled by issues experienced by the News Corp. experiment, despite Felix Salmon outlining all the tablet troubles some news outlets are experiencing with tablet delivery. Here are few of them. But most are fixable. The most prominent issues with tablet native news, according to Columbia Journalism Review. • News applications are clunky, with most requiring a long download for every issue. • Navigation is difficult and unintuitive, with pages less than dynamic and without a search. • Archival issues abound, with most tablet editions being limited to single issue reads and no history. But anyone who understands the native apps and the web a little more than the bold digital experiment by Murdoch won't be fooled into thinking that the tablet is at fault. All you have to do is flip over to Flipboard to get an idea of what can be done without the deep pockets News Corp. once had. • News applications need to drip stories in a steady stream, not make standalone issues. • Navigation is easy when the content is arranged by topic, letting readers prioritize content. • Every great native app can built with archival content in mind, including related links. While I haven't had an opportunity to fully review the free application process for Liquid [Hip], an alternative reviews site, I do know the benefits outweighed any issues. Thanks to the innovative partnering opportunity and programing ability of UppSite, converting web-based content to a native app isn't perfect but closing in on perfect. The biggest advantage is that stories are delivered as they are published, making it faster to retrieve reviews than a browser. And while navigation still needs to be improved by allowing publishers to set major categories and listing the rest of any index as alphabetical (suggestions made by our firm), the potential already exists. Once it is complete, including a search, archived content isn't an issue. While some people might note that web content ported to a native app lacks some media-rich dynamics that publishers want to take advantage of, it seems to me that it still makes the best blueprint. Content delivered one story at a time is better than trying to build editions. Dynamic content, ranging from videos to interactive features, can still be built in easy enough. And, if publishers are paying attention, then they might appreciate another trapping that The Daily exhibited. Weak content. It wasn't that the content was weak per se, but the depth of reporting didn't justify the price. Native apps (or web news sites) need to do a better job balancing short-content appeal while still delivering the depth of reporting that used to set magazines and newspapers apart from the spoonful-sized stories that electronic (television and radio) provided. How do you do it? Building a better news experience for people with mobile phones and tablets. It's relatively painless, really. All publishers need to do is write an executive brief-like lead story (around 350 words) that opens up three to 10 in-depth stories or point-of-view pieces or dynamics (graphs, videos, etc.) that paint a complete picture (along with archival capabilities). Doing so creates the reader choice that most people crave — which is why they search for more content after spending 15 minutes or so with a post online. So no, it wasn't the tablet that doomed The Daily, which was filled with surface content that couldn't justify a high subscription price. Like most failed digital products, it was the development team behind it focusing too much on developing something for a medium as opposed to people who use that medium. If they had done that, then The Daily would have been the best practice and not the pitfall to avoid. But no matter. Sooner or later somebody else will spend their time in the right place and finally get it right. Pamela Muldoon at Next Stage Media has put together a decent list of four simple questions to ask for small businesses that want to explore content marketing. By using a jewelry store as an example, Muldoon was able to flesh up a content marketing primer that every business ought to think about. The first four questions proposed by Next Stage Media. 1. What are the seasonal conversations and events for your business or industry? 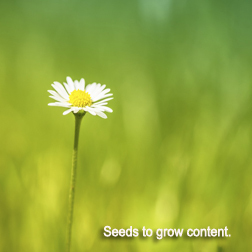 Muldoon suggests that first step of any content marketing begins with the easiest step first. Know when your customers think about your products. In this case, a jeweler ought to be planning for content on or around Christmas, New Year's and Valentine's Day. Advice enhancement: While the advice is spot on, there are plenty of other prompts content marketers ought to consider. St. Patrick's Day, for example, screams emeralds. Many other gems have seasonal appeal too. And any jewelry can create dates by advocating community service and nonprofit connections. 2. What does your target audience need to know about your product(s) based on time of year? It's ideal that Muldoon offers up some in-depth understanding about the customer's purchasing experience. In this example, she suggests knowing the purchasing cycle of the customer — knowing when they are about to propose and how far out they need to plan for the engagement ring. Advice enhancement: This is all smart stuff. If you can raise the right questions and answers at the right time, people will be more likely to turn to you for advice. While that may seem hard to map out, many jewelers can look for proposal trends and then calculate how many months in advance people start thinking about it and shopping for rings. 3. What questions do the customers of your industry have that will improve their current situation? One of the best prospects of social media is to move beyond the product. The point here is simple enough. For the most part, people can buy a 'diamond' anywhere. In order to be more successful, small businesses need to differentiate themselves in different ways. It could be the cuts, stones, designers, personal touch, customer service, or any number of differences. Advice enhancement: Demonstrating a clear contrast between one business and another is critical regardless of the industry. This almost always goes beyond a unique selling proposition (USP) because most USPs are created based on what clients think is the best in their field as opposed to the differences that exist between them and another. 4. What else does your target audience spend money on throughout the year? By far, this was one of my favorite bits of advice. Muldoon correctly establishes that people are 3-dimensional and cannot be afraid to provide content beyond their product offerings. Advice enhancement: While Muldoon suggests offering a larger product portfolio to prospects, companies don't always have to move beyond their product or service offerings. Sometimes advice is enough, especially as it relates directly or indirectly back to the product. Ergo, depending on the jeweler, people (especially existing customers) might like to learn a few fashion tips or closely related topical advice, ranging from etiquette to experiences. The best content marketing strategies consider marketing, public relations and editorial. While I'm not a fan of the pressures to increase the quantity of content marketing, I am very much in favor of improving content quality. All four questions are a solid first step for small businesses to appreciate that they might have something to contribute. Consider it a starter set because once a base is established there are dozens of unique aspects to every business, ranging from new products being introduced to caring for products long after the customer purchases them. It's also a good idea to remember that text isn't the only form of content available. Video, images and interactive experiences can all play a role in developing context. And, above all, never forget to listen to walk-in customers, the questions they ask, and the stories about designers that they want to hear. If you consider all the possibilities after launching base content, new paths will present themselves — areas that are underserved or co-op opportunities that never existed before. As they do, it will also become more clear that content marketing is shaping up to be one of the better integrated communication concepts that any company can effectively deploy next year as long as they think it through first. 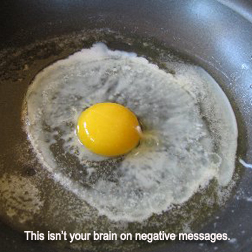 When you think of the most memorable anti-drug commercials of all times, the analogy that likened our brains to eggs usually comes out on top (or at least in the top five). It was straightforward and powerful. Unfortunately, for as memorable as this classic campaign is, it doesn't do the job. According to researchers at Indiana University and Wayne University, negatively framed messages are not the most effective way to reach the people in need of persuasion. The following advertisement or even the entire "just say no" campaign has very little impact on people who are substance-dependent. In fact, the study found that the substance-dependent group showed little brain activity in response to negatively framed messages. In some cases, the negative messaging led to worse or riskier behaviors. It makes sense that they would. Most substance-dependent people have already accepted the risks. Intellect doesn't rule addiction. The real takeaway here is how negative messaging doesn't work on intended audiences. As the researchers have shown using neuroimaging, the negatively charged messages didn't stimulate the brain in substance-dependent people. Being clever isn't enough. Being positive might not be either. In lieu of negative messages, one suggestion was to promote the benefits of staying clean as opposed to telling people what not to do or why something might be bad for them. While this might be on the right track, it still neglects the dynamic relationship between substance and abuse. In order to work, the long-term benefits of staying clean would have to outweigh the perceived and immediate benefits of the drug (from the perspective of the substance-dependent people). Unfortunately, there is a point when substance-dependent people cannot comprehend the possibility. Many of them elevate the immediate rewards that the substance provides until it eclipses everything, including their lives. From a broader advertising perspective, risk-aversion messaging and negative messaging rarely have as much impact on the intended audience as creatives think. Instead, such messages tend to bolster a deeper reaction in people who see such ads as a clever or emotional affirmation of their own beliefs. In this case, people who would never do drugs. So you have to ask yourself. What's the objective? Although many social media practitioners are quick to equate exposure to awareness, they aren't the same. Quantity does not always replace quality. Too much exposure can diminish awareness. This might explain why some social media practitioners who have tried to make social media more scalable with auto-sharing tools might be missing out in the long term. As they continually send out a steady stream from the same sources or send out similar broadcasts throughout the day, their followers slowly begin to tune out. Although many of them will try to adjust by changing out their sources, the problem might not be the content. The problem is over exposure. Too much exposure can actually diminish awareness long term. A psychology study that hints at the over-exposure phenomenon. The over-exposure phenomenon isn't too far off from a new study being conducted at the University of California. It shows that people do not always recollect things they may have seen (or at least walked by) hundreds of times. In the first experiment to consider the validity of the theory, researchers asked people where they could find the nearest fire extinguishers in their office. Despite walking by them every day, only 24 percent could recall where they were located (and not always the nearest ones). Think about this for a minute. 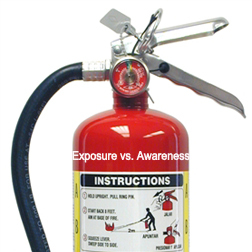 Fire extinguishers are designed to stand out. They are often painted bright red and set against neutral or beige backgrounds. They are also important. In the event of a fire, they could help prevent catastrophic damage and save people's lives. And yet, our brains tune them out. Sometimes social media tries to hard to be a fire extinguisher. The brain does more than tune out fire extinguishers. When faced with over stimulation on networks like Twitter or even Facebook, it automatically tries to tune out everything irrelevant. The brain only wants to see relevant content. One illusion that illustrates this exceptionally well is a red dot placed in a blue circle. As people try to focus on the red dot, the circle will eventually fade away and possibly disappear as the brain decides that the circle is as irrelevant as white noise. It doesn't even matter if there is more blue than red. The same thing happens with sharing. People tend to scan streams for relevant content — things they want to find — and everything else eventually falls into the background (e.g., someone using hashtags for a Twitter chat, a steady stream of auto links, a restaurant reminding them it's lunch time). Worse, over exposure can lead to negative impressions too. Bad commercials, overwritten billboards, political advertisements, and other aggressive marketing tactics are often cited as bothersome, eliciting as many negative impressions as positive impressions. And no, it doesn't matter if the message is important or, as in the case of fire extinguishers, painted bright red. It might sound cynical, but many of conversations about communication are cyclular. They reincarnate themselves again and again. Danny Brown knows it too. He recently noted the reincarnation of Kumbaya communication culture best described as the chronic urge to be nice-nice and non-critical. Skip on having an opinion and play it all safe. As he points out in his piece on the subject, everybody is afraid that having an opinion that will drive away readers (and even advertisers) from their blogs or extended networks. Fear is a powerful motivator for most people, especially when they think they have something. He takes a different tact. 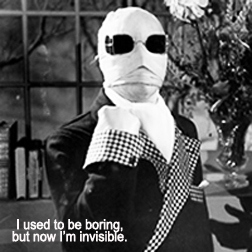 Boring isn't in ... it's invisible. Brown makes a good point. There are around 200 million blogs being published (and I'm not sure this counts online newspapers and magazines). All of them are competing for some scrap of attention. This isn't 2005 when there were only half that amount. Back then, publishing a blog felt like enough, especially in neglected niches (like communication was then). Everyone was pretty even back then, with everyone scrutinizing each other for giving bad advice (or good advice). There were even foils in the crowd, hellbent on criticizing everything. Some people hated it. I thought the industry needed it. But then things took a turn. The various communication industries (public relations, advertising, emerging social media, etc.) developed a healthy dose of fear. The people who staked a claim were worried about image, stuff I used to liken to the borg or, better yet, pirates. I wasn't the only one. Ironically, the people who promoted the idea of landing somewhere between neutral and nice had the most to gain. When all things are equal, people tend to gravitate to the most popular people and not the most popular content. It's no surprise. This is the same phenomenon that occurs in media circles. Big brands can do almost nothing and get media attention. If a little brand does that same thing, nobody cares. Ergo, when Gen. Petraeus has an affair, expect headlines. When it is your neighbor, nobody cares — not even you (unless your spouse is involved). It's the way the world works. If you only write to rubrics and rules, you're boring. To compensate for the rebirth of vanilla, Brown suggests more bloggers play the part of a contrarian. And, for the most part, he's right. If you see something wrong, don't be afraid to point it out. It doesn't matter who the author is or how big their following or how many times it's been shared. If someone doesn't vet the industry now and again, all sorts of oddball standards begin to take hold. While you might earn some pushback or an occasional mob-like reaction from their loyalists, it won't stick. Any rub ups over opinions usually last no more than a few days or a week a worst. In a month or so, you'll barely remember it happened (whether it pops up in Google searches or not). Well, some people might remember. But that requires a different tack all together. You have to be able to accept criticism before you offer some of your own. For example, I received all sorts of flack for criticizing and calling the demise of Utterz. But that all ended in a few months, after it folded. 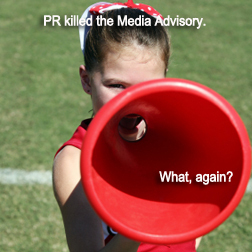 A recent Ragan extra more or less declared the term "media advisory" dead, along with "for immediate release" as good measure. In fact, the eight reasons why public relations professionals ought to stop using these phrases was not only good for a laugh, but also shareable in some circles. Maybe so. Number 5 was especially funny: "Just because a college professor or some PR agency taught you to write 'media advisory' or 'for immediate release' doesn't make it meaningful or right. (sic)" Keith Yaskin, who wrote the piece, is somewhat right. Those reasons alone don't make using the terms right or meaningful. But then again, neither does taking advice from a random hack. Have news release headers lost their luster? Maybe, but not for the comical reasons that Yaskin provides. If news release headers and instructive phrases have lost their meaning, it's because many public relations professionals never learned what it all meant from the beginning. Something was missed during their transition from copy editor to reporter or administrative assistant to public relations practitioner. Let's start with the obvious. Headers are simply meant to tell journalists and television reporters what the content might be. A new release was supposed to contain news. A press release was supposed to contain information that may or may not be news (although some old school television reporters used to tell me they hated the term, given the association with printing). A feature release might contain soft news. A media statement was commentary from someone with an opinion or comment on something. And a media advisory? Contrary to the chortle that media advisories are an attempt to masquerade as the U.S. Coast Guard, the header used to have real meaning. Media advisories were a heads up to media that something was going to happen — such as an event, opening, tour, press conference, public statement, etc. — that might be worth dispatching a news crew or photographer to cover it. A media advisory wasn't meant to earn column inches or publicity pixels. All it was supposed to do was let the media know that something was going to happen that could constitute news —from the mundane (like an opening) to the bizarre (a new world record for the biggest hoagie). It was predictive. And as such, it wasn't necessarily ready for print or broadcast because it hadn't happened yet. Why "for immediate release" lost its meaning in the hands of flacks. Much like news release headers were meant to be instructive, so was the cutline "for immediate release." It was never meant to be a standalone. Like headers, there were other options until some agencies (and now most agencies) started to use the phrase ad nauseum, causing people like Yaskin to toss up their hands and chuckle. Joining "for immediate release" was "for release at will," "for releases before or after [date],*" "for release by [date]," and so on and so forth. It worked, until public relations firms and in-house organizations thought that "for immediate release" carried a greater sense of urgency. They were guided by the mistaken belief that everything they sent required immediate attention and immediate coverage because that is what they taught their clients to expect. Never mind that journalists used to hang onto "for release at will" content a little longer in case the news of the day dictated that the story might fit (and hadn't gone stale). Sure, it's less likely they would keep it today because content is cheap and there is a steady stream of it, every single day. As I pointed out in one of my presentations, there are approximately 1.4 million news stories put out every day and 4.3 million news releases. Of those, only about 140,000 news stories are inspired by news releases, making the odds of coverage rather slim beyond a blurb or passing mention. Those figures, by the way, are two years old. There is a good chance we've doubled the content overload in the last two years, without even counting all those posts, white papers and whatnot. Don't blow things up until you have a backup plan. If there is one thing I've learned after a few decades in business (as well as community advocacy), it is that ignorant people are quick to cut anything they don't understand. It's especially easy when they don't have any industry knowledge, insight or history. Right. All those meaningless little things might actually mean something, but you have to take the time to know what they are and why they are perceived to be important. If the answer is useless — such as "we do it this way because we've always done it this way" — then it makes sense to let it go. But if there is a meaning behind the apparent madness, then it might be worth preserving. But then again, I'm not making a case to preserve "media advisory" or "for immediate release." If neither the journalists and broadcaster nor public relations practitioners know the meaning of these headers and instructional phrases, then they might as well be dropped. Or maybe not. The choice is really up to each professional or quasi practitioner. Use it or don't use it, but at least you won't be ignorant as to why it was used in the past. As for me, personally, I'll include whatever clearly communicates to the intended audience whether others want to muddle the meaning or not. *As a side note, it might be helpful to know that "for release after [date]" is different than an embargo. According to the Content Marketing Institute, B2B marketers are bullish on content marketing. 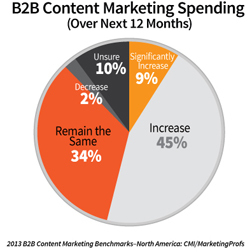 Almost 90 percent of B2B businesses (88 percent) will retain or increase (54 percent) their content marketing budgets in 2013. Ten percent aren't sure if their budgets will be increased/decreased, leaving only 2 percent expecting to cut their content marketing budgets. While all this data suggests that content marketing — articles, blogs, infographics, email newsletters, and social networks — works, it's not working for most. Only one-third of these marketers believes their content marketing is effective. So why invest more? B2B doubles down on quantity, not quality. With the majority of B2B marketers developing large in-house teams to manage all their content marketing efforts, many think that their greatest challenge will be producing enough content. That means more posts, more email, more social network updates, and more [fill in the blank] will be the new measure of success. What many don't realize, however, is that they are contributing to the largest marketing arms race in history. It's the outcome of a strategy, if we can call it a strategy, that suggests whoever produces more content wins. Yes. Over saturation alone, literally drowning the audience in communication, will somehow lead to greater market share. It makes sense that they think this way. Seventy-nine percent consider brand awareness the number one priority for their content marketing efforts. Almost half believe that sharing content is an important measurement. More than half believe that website traffic is a leading measurement criteria for success. It's also unfortunate that they are mostly wrong. Sound strategies that produce tangible outcomes produce success. The rest of it is magic, with maybe a little smoke and mirrors. On any given day, I can increase my site traffic by several thousand percent. It doesn't take much effort. A few ad buys here and there can make the least valuable content ever published look popular. The real question is whether or not the content is effective, which is directly dependent on strategic goals and not shares or likes or the usual measures. Setting goals to sales isn't a suitable measure either. All marketing efforts directly or indirectly support sales. If they didn't, why would a company chose to do them? It doesn't really make sense. Setting the right objective is a simple concept that eludes many marketers. There are dozens of ways to slice strategic communication, but let's start with one — the most obvious. Marketers ought to be less concerned with brand awareness and more concerned with brand integrity. Brand integrity means that not only do people know who you are, but also what you do and, ideally, that you do it well. Awareness alone is futile. Ergo, Gen. Pertraeus has more brand awareness now than at any time in his career. The scandal ought to be a footnote in his career and not the other way around. It might have been a footnote too, but awareness has eclipsed any previous integrity that reached a smaller audience. The point is what we communicate is ten times as important as how much we communicate. And what we communicate ought to be based solely on the objectives of the company. Sure, there are a few baselines that ought to be considered minimums for certain media (e.g., writing a blog post once a month is not necessarily better than none), but marketers might start thinking smarter than simply trying to outproduce and outspend their competitors. If you don't think your content marketing is effective, it probably isn't. And if it isn't, it ought to be fixed before you toss in more dollars.